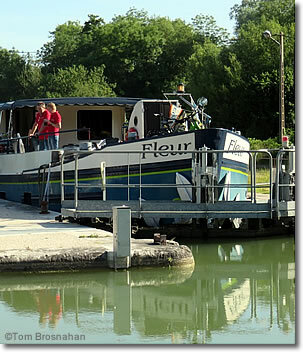 "Fleur" is a canal barge registered in Holland, with a Dutch crew, cruising the canals in France and other European countries, providing memorable vacation experiences. Built in 1963 as a freight barge, Fleur was converted to a floating boutique hotel in 2001 and now cruises along the canals in France to the delight of small groups of voyagers. The long, narrow vessel (38.7 meters/128 feet long by 5.07 meters/16.63 feet wide, 4.1 meters/13.45 feet high when the wheelhouse is up, with a draft of 1.65 meters/5.41 feet) has ten comfortable air-conditioned twin-bed sleeping cabins with private sink, shower and toilet. The lounge area has sofas, coffee- and tea-making equipment and snacks. The 20-seat dining room includes a small honor bar. The bow deck offers awning-shaded and full-sun tables and chairs, and parking for the Fleur's 20 bicycles. The water on board, in tap, sink and shower, is potable and pleasant. Toilets are flushed with river water which then goes to a wastewater holding tank for ecological disposal. Electricity is 240 volts 50 Hz AC, with European-style outlets. Power is provided by generators or a shore connection, depending on the mooring. Wifi Internet is usually available via a mobile connection, which may be slow or occasionally unavailable. Data throughput is limited to 50Mb per person per day, which is sufficient for daily email and some browsing, but not for streaming or for uploading or downloading large files such as photos or music. Fleur under way on the Seine south of Paris. The crew of four includes the Captain, Mate, Housekeeper and Chef—all extremely friendly, competent, helpful, and multilingual (English, French, Dutch). Fleur is owned and operated by Eurosail. You can arrange a bike-and-barge cruise by contacting International Bicycle Tours, Inc. of Essex, Connecticut, USA.